Since taking office just over two years ago, President Abdel Fattah al-Sisi has announced a number of ambitious economic reforms and policies. But they seem more designed to show the world that the country is ready to reemerge as a major economic player than to actually substantially improve Egypt’s infrastructure. Carrie Cuno is the editor of PS21 and (in her spare time) works in development in Washington DC. She tweets @ccuno. According to a report released by the World Bank, 71.6% of the Egyptian population lives below the poverty line. But the Egyptian government has always made it easy for the foreign tourist to visit ancient attractions without having to see any of that. Consider, for example, Luxor and Aswan, southern Egypt’s two tourist hubs. Though many ancient sites are near these two towns, some of history’s most fantastic monuments were, irritatingly, built in remote parts of the region. So the government compensated by building clean, sterile roads through the desert where the pit stops are modeled after the American convenience store. The tourism industry, long considered the backbone of the Egyptian economy, was hit especially hard by the political instability that followed the 2011 uprisings. So it’s not surprising that the government is now trying to rebrand itself as a stable, prosperous country. Since taking office just over two years ago, President Abdel Fattah al-Sisi has announced a number of ambitious economic reforms and policies. But they seem more designed to show the world that the country is ready to reemerge as a major economic player than to actually substantially improve Egypt’s infrastructure. Last March, for example, Egypt’s housing minister announced his plan to build a ‘new capital city’ located just outside of the greater Cairo area. Officially, the new capital will cut down on overcrowding and congestion. In reality, though, if the project is completed—which is certainly not a given—it will look more like a paradise for foreign tourists than Egyptian residents, with 40,000 hotel rooms, a bevy of foreign embassies, an international airport, and “a theme park four times bigger than Disneyland,” according to Madbuli. It’s a political statement: a signal to the world that the country has literally moved past the uprisings that took place in the center of Cairo more than five years ago. This announcement preceded the completion of an expansion to the Suez Canal. Sisi’s claim that the expansion will grow Egypt’s economy exponentially has been debunked by experts–in fact, it may actually weaken national security. Though the expansion will undoubtedly be vital to decreasing canal traffic in the near future, there was no reason to for Sisi to spend billions of extra dollars to complete it by an unrealistic schedule—except, of course, to show that he could. Furthermore, its continual use of exaggerated promises and over-the-top rhetoric has invited much international criticism. As Timothy E. Kaldas said in a recent op-ed, ‘expanding a canal is not a “miracle,” as officials claimed.’ And the accompanying celebration, which cost an estimated $30 billion dollars, was seen by many critics as an insult to the vast majority of the population who are living in poverty. However vehemently the government insists that it is behaving democratically, it is clear that there’s a huge gap in between their best interests and the needs of the state. This year alone has also seen a crackdown on nearly 500 NGOs, the resignation of Egypt’s agriculture minister amidst charges of corruption, and the conviction of three Al Jazeera journalists accused of supporting the Muslim Brotherhood (two of whom, at least, were recently pardoned)—scandals that are seriously embarrassing for a government desperately trying to appear legitimate. Ultimately, the canal expansion and economic reforms – if not the new capital – will benefit the Egyptian people, and there’s an argument to be made for any policy that could reinvigorate the country’s tourism industry. 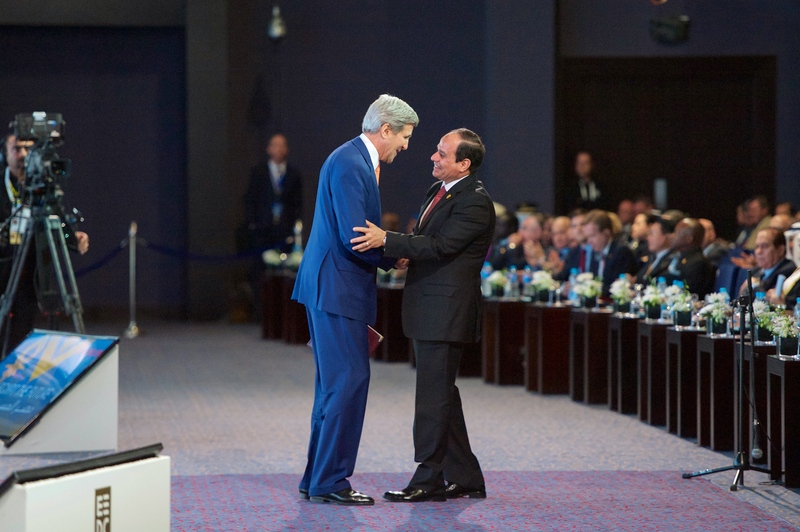 Sisi is clearly aware that the best way to bring back foreign visitors is to appear politically stable. But he can’t do this by cracking down on even the quietest murmur of dissent and papering over these corruptions with grand schemes. As obvious as it may seem: the government needs to focus on implementing policies that substantially improve the country’s economy, infrastructure and regulatory system—not proving itself to the rest of the world. PS21 is a non-national, non-ideological, non-govrnmental organization. All views expressed are the author’s own.